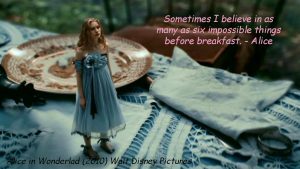 I saw this quote with an image from the Walt Disney Productions animated film. 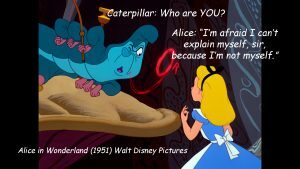 In fact, it is from the book by Lewis Carroll. Still, it’s a great quote that I could relate to, particularly after my caregiving experiences. 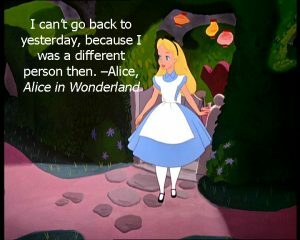 After reading the quote, I re-watched the original 1951 version of Alice in Wonderland and the 2010 live action remake. 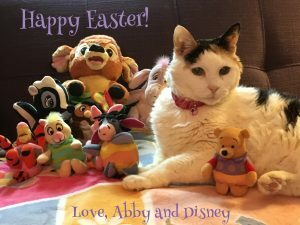 Although I have to admit that they are not among my favorite Disney films, there is a lot of wisdom and insight, as well as some welcome sarcasm, that helped me reflect on the impact of caregiving on my relationship with myself and with others. My dad’s cancer diagnosis and then Ben’s diagnosis of ALS plunged me down a rabbit hole, alone, devastated and confused. I wanted to be the little girl who was taken care of, but suddenly I had to deal with very adult realities and take care of my loved ones. The teams treating my dad and Ben gave me instructions and details that sometimes tugged at my own beliefs and my emotions. Especially difficult was taking on the role of parent with my own parent. Instead of being the child protected by my dad, I found myself fighting his negative attitude and working with doctors and nurses to make important decisions for his treatment plan while convincing him to comply with orders because he could have a good quality of life. While ordinarily soft-spoken and shy, I learned that I could be a fierce and resourceful advocate. I was insistent and relentless when it came to getting the most appropriate services for my dad and for Ben. There was a lot of information and I was given a lot of advice, and I frequently felt out of control. There were so many people- professionals and people close to me- telling me what I had to do and how I had to deal with things and, when I was spiraling downward, I very easily took direction. But, there were also times that I felt like I could take the reins and make my own decisions. At those times, I did what I felt was necessary, regardless of judgments and disagreements. That was not always easy for the people I had relied on who were used to directing me, especially those people who naturally like to take control and give direction (I do wish I was a little bit more like that!). As difficult as it was for some people to see me making more of my own decisions and taking a stand, it was hard for me to change my own self-perception. It was also hard for me to say no to people, or to express my disagreement. I listened politely, even if I did not heed the advice, because I did not even have the inner strength to disagree. I guess I generally fall into the category of “people pleaser.” To be fair, I believe that people had our best interests at heart and I appreciated that. But, as I saw myself successfully handling more caregiving responsibilities, and my dad and Ben became more and more reliant upon me as I gained better understanding of their feelings, I felt my confidence growing, and with that came a growing resistance, accompanied by some discomfort, to automatically complying with what I was told I “had to” or “should” do. As Ben’s ALS progressed, and things became much more difficult than Ben was willing to admit, I was frustrated and overwhelmed, and also resentful. I was struggling with those feelings because Ben was dying and I felt that if he wanted to live in denial, then I had to accommodate that. I gave myself all sorts of advice, having internal dialogues about insisting on more paid help, requiring Ben to prepare legal documents to make other important arrangements, and making scheduling changes that might have made daily life more tolerable. I had a lot of good ideas! 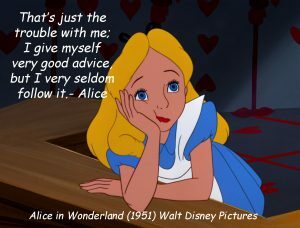 But, I rarely followed my own advice. At times, I got angry at myself and felt helpless and defeated. I’m sure that it frustrated people who cared about me to see me drowning as I had a good sense of what needed to be done but lacked the emotional ability to make it happen. I have thought about that a lot, and, to this day, although I know that a lot was not right about the situation, I know that Ben felt cared for, protected, and loved. 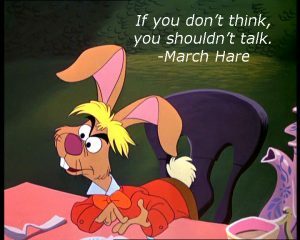 Sadly, I achieved that by often ignoring my own good advice. I cannot begin to count the number of times I wished that something in my life would make sense. Juggling caregiving for my dad and Ben would have been comical if it was not so serious. There were middle of the night calls from my dad when he was deciding if he should go to the emergency room. If he went, I would ensure that Ben would be okay and arrange back-up if he needed help, and then I would meet my dad at the hospital. From the hospital, there was an endless string of calls and texts to report on my dad and to check on Ben. There were the ridiculous restrictions of what insurance would cover, when clearly ALS is a terminal disease that renders a person needing much care. There were my klutzy attempts to address the needs of Ben and my dad, which they denied were increasing, while trying not to upset or discourage them. There were the routines we painstakingly created that had to be immediately scrapped because Ben exhibited a new symptom of ALS that rendered the plan useless. We just wanted something to make sense. That never really happened, but we embraced it as our new normal, with a sense of humor when possible. 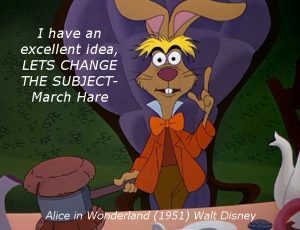 I do love the whimsy and fantasy of Disney. But, if you follow this blog, you see that there is a lot of inspiration and insight in the films, and it helps me. 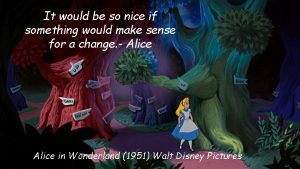 Although I find comfort in thinking about wishing wells and fairies with pixie dust, my life and decisions are quite grounded in a reality that was, for several years, anything but rainbows and magic. As a caregiver, and then in grief, it has been so important for me to surround myself with the things that gave me comfort and let me at least mentally escape. I could get lost in fantasies in the same way that Alice dreamed about creating a world of her own. 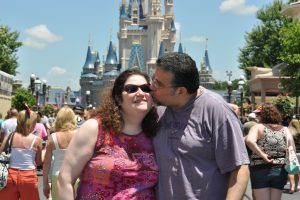 For Ben and me, Walt Disney World was that special world of our own. 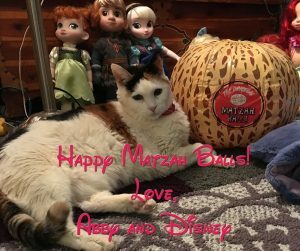 Disney films, toys and memories still give me that much needed opportunity to fantasize, but also help me to sort through ugly experiences that come with caregiving and loss. It is so important for caregivers to identify and retreat into the things that provide comfort, insight and perspective, even if it is a momentary escape from the comfort of your sofa. As I emerge from grief, I don’t always recognize myself or know exactly who I am or who I want to be. I feel like I’ve changed. But, I can finally say with some pride that, despite my tears, I faced and handled some very difficult situations with and on behalf of Ben and my dad as they took their journeys from this world. There were times that there were conflicts with family and friends, but I honored the wishes of my dad and Ben, and I did what I believed was best and was most consistent with their wishes. I know that my loved ones want the best for me and that means the world to me. But I also realize that as much as I have gratefully relied on others to guide me when I run in circles, I have to move forward at my own pace, shaping and fulfilling my own dreams on my own terms. I have to determine where I want my life to go. And, I am fortunate that I am surrounded by people who are cheering me on. I do have some inner struggles, and, in a few cases, relationships that I do care about have been strained and tested, and that has not been easy. 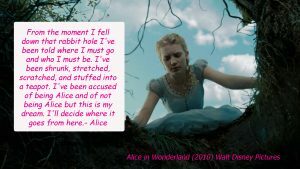 But, as the White Queen said to Alice, “You cannot live your life to please others. The choice must be yours, because when you step out to face that creature, you will step out alone.” This was also true for Ben and my dad as they faced death, and it is true for all of us. 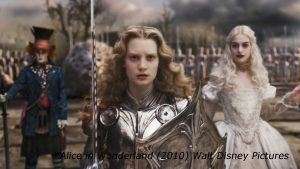 In the live action Alice in Wonderland, Alice must slay the Jabberwocky to defeat the evil Red Queen. As caregivers, we have our own Jabberwocky to defeat, as we tackle trying circumstances and help our carees battle the demoralizing and painful effects of illness. Though we cannot defeat death, we are fierce in our battle to slay many obstacles and provide as good a quality of life as possible for the carees whom we love. I want to wish a Happy Passover to all who celebrate the holiday. Holidays became melancholy when Ben and my dad were ill and I was caregiving. Looming over the days was the thought of whether they would be our last holidays together. I am not someone with deep religious faith, so I always felt a bit out of place on holidays like Passover. When you are a caregiver for someone who cannot participate in festivities, celebrating may seem like too much of a reach, and it may feel downright inappropriate to use the word “celebrate” with its connection to joyful indulgence. But, holidays may serve as an important time for reflection on our faith and indeed, a thoughtful celebration of our memories. Faith is important, however you define it. I have written about faith and how it has helped me to get through caregiving and grief. Faith is that intangible belief that things will be okay that allows us to have some optimism. Optimism does not necessarily mean the expectation of a happily ever after in the traditional sense. It may mean that we need to look at life day by day, moment by moment, as opposed to the whole scope of a situation, which can be overwhelming. As a caregiver, each moment that you engage in your loving and giving work can be filled with the faith and optimism that you can help your loved one, make them more comfortable, advocate for them. Despite the sadness, I have found this to be a beautiful and somehow sacred bond to be honored and treasured. 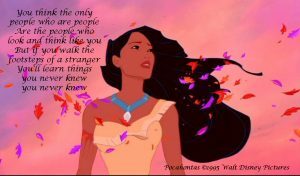 These lyrics are from the song Colors of the Wind from Pocahontas. In the context of the film, the song relates to people learning to accept and open their minds to people of other cultures and races. I found myself thinking of the many people we may judge without really knowing them, their stories, and what it is like to be in their lives. I think about the way people responded to the way Ben chose to live and die with ALS. It is easy to have opinions, and it’s fine to have them. I have them, too. We were fortunate to have many people close to us who put aside their opinions to create a solid support network. But, there is a line that is crossed when opinions become harsh judgments that are made without full knowledge of a situation, and, more importantly, without an attempt to see a situation through a different lens and get a glimpse at what it is to “walk the footsteps” of another. When Ben was first diagnosed, suggestions were offered by his ALS team, who had followed many people on the sad and excruciating journey of this disease. There were opinions from our friends and family. I had my own thoughts. But, Ben had to choose his own path. No one could really know exactly how he felt about facing the loss of his abilities and, in essence, his freedom, as he faced death. I lived with him every single day and talked to him about these things, trying to walk his footsteps, and I still could not truly envision what it was like to be him. Still, there was a lot of “what you should do” and “what you have to do” from people who had much to say, yet did not ask Ben (or me) questions that would have given them insight into his experience and allowed them to acknowledge and comfort him, rather than simply judge and direct him. Shortly after his diagnosis, Ben told me that he would understand if I wanted to leave him, if I could not handle what was happening to him and if I wanted to have a different life. From his perspective, he loved me and wanted the best for me, at the same time that he feared and wanted to prepare for the possibility that I might leave him. Indeed, some people told me that I should leave him. To walk in my shoes would mean that you perceived my overwhelming fear, anger and sadness but knew that I would never leave this man whom I loved and who needed me. And, to walk in my shoes would mean that you would realize that even when he was harsh and unkind, I would either defend it because of his illness, or believe him and think that I must not be a very good caregiver, or feel helpless because he was a dying man and I was devoted to him. There were many times throughout Ben’s illness that I would have liked to tell people – strangers and those close to us – to try to walk in our footsteps. At Walt Disney World, when Ben did not have visible signs of disability in the early stages of ALS, some guests treated him as if he was simply lazy by using a scooter, and were clearly annoyed when loading the scooter delayed a bus and when it took up seating space. Instead of being defensive and angry, we were anxious and unnecessarily apologetic for the delays. That said, there were many people who also offered assistance if they saw me helping him to stand or transfer from the wheelchair, and they were kind and good humored with Ben. Try walking in the footsteps of someone who does not have the freedom to easily step on and off a bus and has to awkwardly and anxiously enter and secure a wheelchair while being watched impatiently by other riders. Imagine knowing that this is only the first of the abilities that you will lose and that this may be the last time you will ever be able to travel. We never know the big picture behind what we are seeing, so it is important to suspend snap judgments. Ironically, though there are often controversies regarding visitors to Walt Disney World who illegitimately request disability passes to get to the front of the lines, Ben never wanted special treatment or to take advantage of having a special pass for the attractions. I must also add that the Disney cast members on the grounds and transportation were always fantastic. There were many instances in which people bypassed Ben and only addressed me. When his speech became impaired, he joked that if they heard him speak they assumed he was somehow mentally challenged, and, although it did bother us, I was glad that he had a good sense of humor. However, I was quick to involve Ben in conversations, because I wanted people to know that he was fully capable of communicating and understanding, even if he needed my help. Then, some people realized that they could engage with Ben. Think about how it must feel to be ignored when you are vibrant, able and wanting to be a part of a world that is becoming increasingly distant. Just acknowledging someone’s presence with just a smile can lift a person’s spirits. It certainly lifted mine to see him respected and happy. Compassion goes a long way. Seeing things through another’s perspective is not always easy, especially when you are dealing with someone who has a terminal illness, like ALS. Among my biggest frustrations was that some of the people with the strongest opinions, arguments and accusations were also the people who were not actively or consistently involved in Ben’s care. They promised to visit and did not. They did not try to gain a clear picture of his medical and emotional situation and dilemmas or ask how they could help, but they were vocal with their criticism, even if completely unfounded. Instead of walking in his footsteps, they stepped on his feet and tripped me up with the unnecessary drama they created. It is imperative to be honest with yourself about the role you have had in someone’s care and life, and to recognize when to put aside your own needs and agendas, in order to watch and listen, and to “learn things you never knew you never knew.” With that insight and knowledge, you are more able to play a meaningful part in someone else’s journey. In Ben’s fifth year with the disease, he made the choice to proceed with plans to get a feeding tube but those plans were interrupted by an urgent respiratory crisis that landed us in the emergency room. Then, admitted to the hospital with a biPAP mask and being fed intravenously, he had to decide for sure if he wanted a feeding tube and a tracheostomy. It took him more than two weeks to make that decision. I held his hand, I tried to answer his questions and to get a sense of what he was feeling, but I could not tell him what to do. I was worried about what his quality of life would be in a skilled nursing facility, which was where he would have to go with a tracheostomy. However, talking to him helped me to understand that Ben was focused on living and the things that he would be able to do. I could not begin to imagine all he was experiencing, but talking to him helped me to see his viewpoint and gain insight into his thoughts. I embraced his beliefs and supported him. Ben did decide to get the feeding tube and tracheostomy, but things did not go smoothly in the hospital. He quickly developed an infection and then pneumonia. He was miserable. After a few weeks, he made the decision to go to the hospice unit of the hospital and to be removed from the ventilator, which was his life support. Life and death decisions can be debated based on a range of convictions, from emotional to clinical to religious. Ben navigated his journey with ALS in a way that was right for him. I respected that and I admired his bravery. I had to see his situation through his eyes, and although I did agree with him, I understood that agreement with him was not the issue. I was there for him. Whether you are a caregiver, friend, family member or even a patient, it is so important to try to walk someone else’s footsteps. Maybe I did not handle being a caregiver the way some people thought I should and maybe I did. Maybe Ben did not navigate his life with ALS the way some people thought he should, and maybe he did. Keeping an open mind, even if we do not agree, helps us to “paint with all the colors of the wind” and support each other with a more positive, meaningful, loving and helpful connection.